Watch full One Piece Season 15 Episode 10 English Dubbed full HD online. One Piece Episode 526 English Dubbed online for free in HD. The captain of the Flying Dutchman reveals himself as Vander Decken IX. He orders Wadatsumi and Ankoro to kill the Straw Hats. Franky realizes that he cannot use the Coup de Burst to flee, as the Thousand Sunny will run out of fuel. 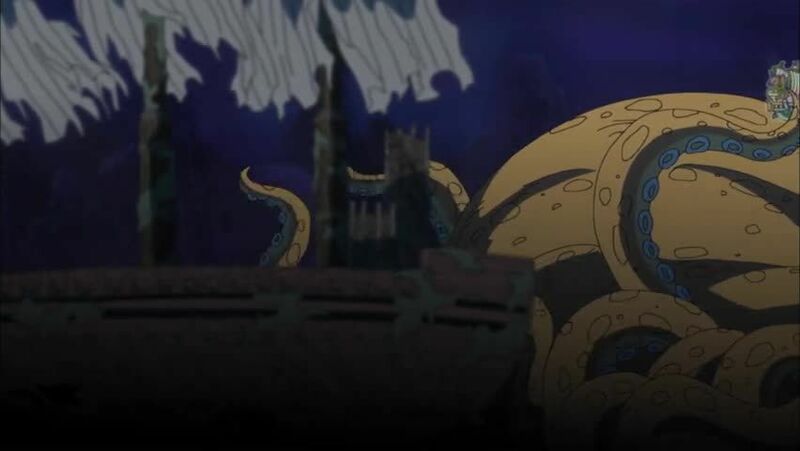 However, Luffy, Sanji and Zoro arrive with the Kraken, who was named Surume, and rescues the others by defeating Wadatsumi. However, a volcanic eruption causes Decken and his crew to flee. Using Surume as a guide, the Straw Hats go even deeper into the sea. Despite Usopp use of the Green Star: Sargasso technique to stop the avalanche, Surume is knocked out and the crew descends 10,000 meters below. The Straw Hats are eventually cornered by another fishman crew.